A musical play. Adaptation, stories & songs by David Wood. From the books by Enid Blyton. First performed at Wimbledon Theatre, and on tour in 1995, presented by Clarion Promotions. 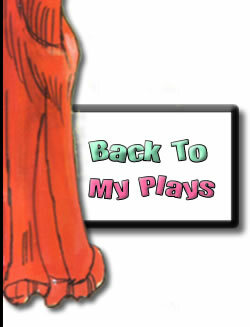 MORE ADVENTURES OF NODDY consists of two one-act plays. They could be performed separately, as they are both self-contained. NODDY AND THE NOAH’S ARK involves most of the familiar book characters, including Big Ears, Whiskers the Cat (a puppet), Bumpy Dog, Tessie Bear, Mr. Plod, Sam and Sally Skittle and the goblins, Sly and Goblin. Mr. Noah needs financial support to keep his animals fed. Tessie Bear and Noddy collect sixpences for the cause. But the collecting box is stolen by the goblins. An exciting quest to discover the culprits leads our heroes to the Dark Wood. All ends happily with a Grand Concert. In NODDY AND THE TOOTLE, Noddy and the other familiar characters meet the Great Tootle, a travelling magician, who is able to make people dance by playing his penny whistle. The Great Tootle gives Noddy three wishes, but one of them sends Tubby Bear, who has stolen the penny whistle, “up to the clouds”. Noddy magicks Tubby Bear’s return, but the whistle is still up in the clouds. Big Ears arranges for a flight in an aeroplane and the penny whistle is eventually restored to its rightful owner. There are several catchy songs and a lot of audience participation. 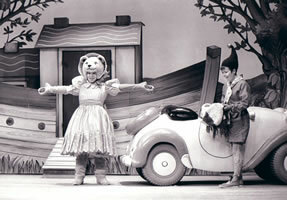 Noddy’s famous car features in both stories. 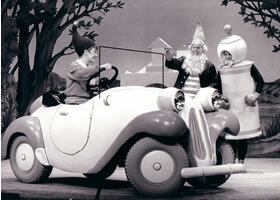 David Wood writes : This play was a follow-up to the earlier NODDY, which had successfully toured the UK. I was delighted to be allowed by the Enid Blyton Estate to create a brand new story – NODDY AND THE TOOTLE. It used elements from the original books, but offered an original storyline. Susie Caulcutt designed a beautiful production, which faithfully reproduced the original book illustrations. 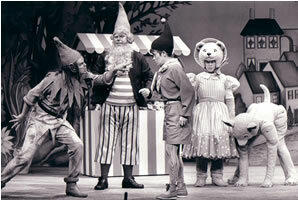 The success of the production was indicative of the continuing popularity of Noddy, who first appeared in print in 1949, and who has been a children’s favourite ever since. The play and piano/vocal score are published by Samuel French Ltd. First Class Professional, Repertory & Foreign Rights : Casarotto Ramsay Ltd. UK Amateur Rights : Samuel French Ltd.